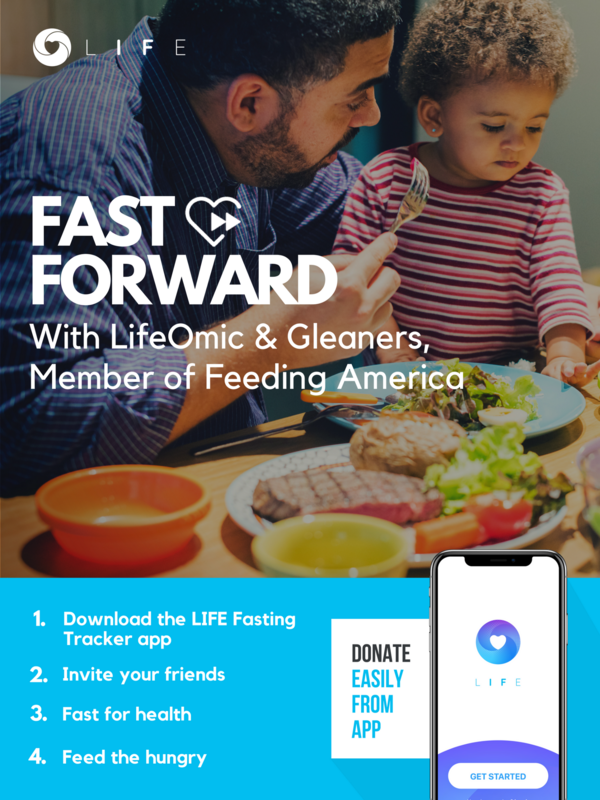 To celebrate the release of its LIFE Fasting Tracker app, LifeOmic is partnering with Gleaners, a member of Feeding America, to help intermittent fasters Fast Forward by donating meals and fresh produce to food banks. Download the LIFE Fasting Tracker app today to Fast Forward. What, when and how much we eat can significantly impact our health and quality of life. LifeOmic’s new LIFE Fasting Tracker app for intermittent fasting helps people with access to plentiful, nutrient-rich foods optimize meal timing to improve metabolic health. But many Americans don’t have the luxury of fasting and eating for health. Did you know that 1 in 6 people in America face involuntary hunger? In Indiana alone, there are more than 1 million individuals who are hungry, either chronically or intermittently. Involuntary hunger has wide-reaching consequences on every aspect of a person’s life, from children’s educational achievement to adults’ performance at work. Today, LifeOmic launched a food drive campaign for Gleaners Food Bank of Indiana (LifeOmic’s headquarters is in Indy) within its LIFE Fasting Tracker app. App users can easily donate with a single gesture within the iOS app, when they end and save a fast. As LIFE app users fast to improve metabolic health and potentially extend healthspan, they can pay it forward by donating the cost of a breakfast, lunch or dinner they fast through to help feed someone in need. 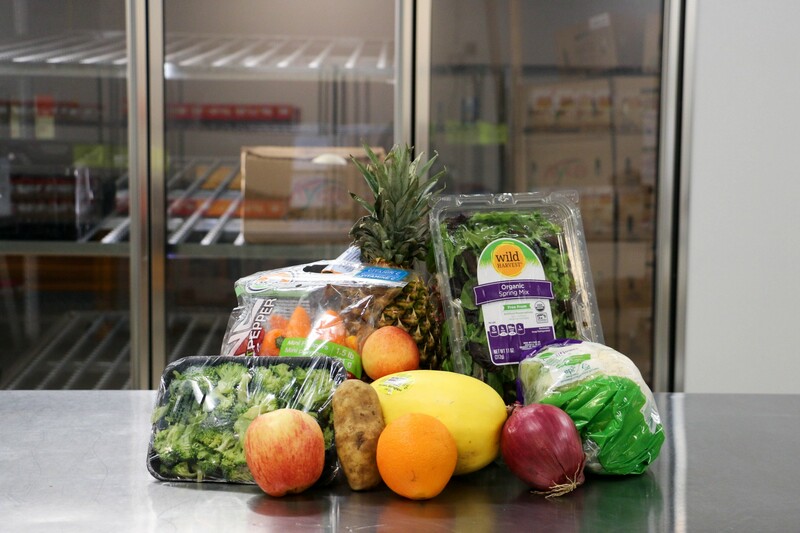 Paying forward a $5 meal buys 15 meals for hungry individuals and families in seven states with Gleaners, including fresh fruits and vegetables. Fasting for health? Are you passionate about improving the nutritional quality of food delivered to underserved communities? 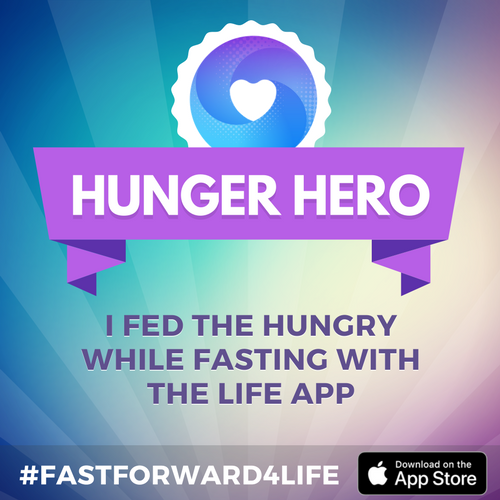 Fast Forward for LIFE, with the LIFE Fasting Tracker app, today. Your donation will help Gleaners provide healthier foods, including fresh fruits and vegetables, to individuals and families in underserved communities in seven states. A selection of produce available in Gleaners’ Cynthia H. Hubert Community Cupboard food pantry. Photo credit: Alex Holland, Gleaners. 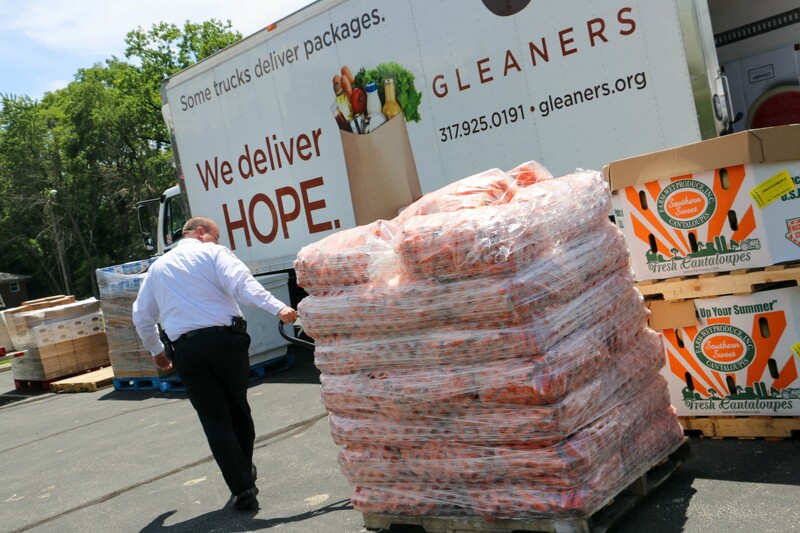 We chose Gleaners as the target for our Fast Forward food drive because this food bank is a leader in terms of improving the nutritional value of food for hungry Americans. Last year, Gleaners was chosen to be one of seven produce cooperatives for Feeding America. They now run the Midwest Produce Cooperative for Feeding America, working with 39 food banks in 7 states to serve nutritious fruits and vegetables of the highest quality. The food banks Gleaners works with no longer have to use rescued produce, and are able to deliver healthier foods to underserved communities. This year, Gleaners has the goal of making 30% of the food they distribute consist of healthy fruits and vegetables. They are also the first food bank in the state to hire a registered dietitian as a nutrition manager to ensure high nutritional quality in the food they distribute through all of their programs, including their food and mobile pantries and their weekend backpack trips for kids. We interviewed Gleaners’ Nutrition Manager Sarah Huber to learn more about how food banks are focusing on not just more food for the hungry, but better food. Sarah is a Registered Dietitian Nutritionist (RDN) who graduated from Purdue University in 2016 with a Bachelor’s degree in dietetics and a minor in Spanish. She has extensive experience in clinical, community and food service nutrition, including a dietetic internship at OSF Saint Francis Medical Center in Peoria, IL. 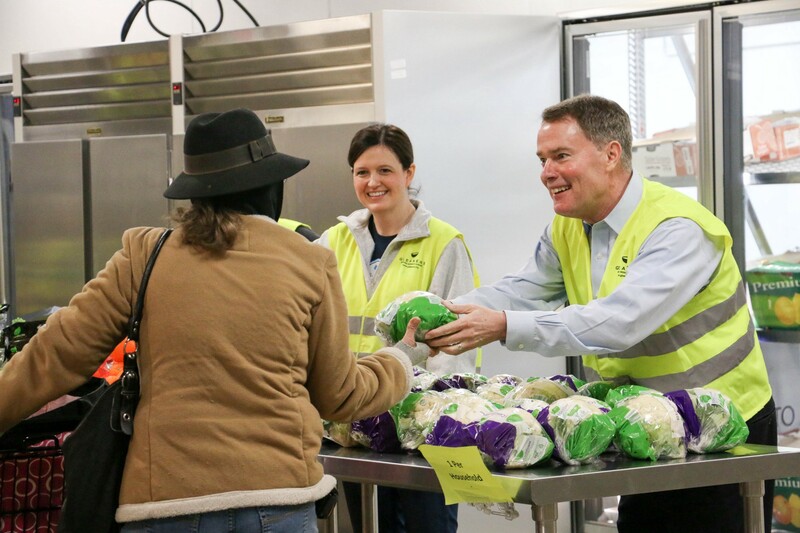 Mayor Hogsett handing out fresh produce to pantry clients in Gleaners’ Cynthia H. Hubert Community Cupboard food pantry. Photo credit: Alex Holland, Gleaners. LifeOmic: Why are you passionate about improving the nutritional value of food bank contributions and food bank nutrition education programs? Sarah: Food insecure individuals and families are disproportionately at higher odds of developing diabetes, heart disease and other chronic diseases. One reason for this health disparity is that the foods largely available to and affordable by this population tend to be nutrient-poor and energy-dense (think fast foods, convenience store foods and sugar-sweetened beverages). Providing access to nutritious foods that may be out of reach for this population — fruits, vegetables, lean proteins, whole grains, dairy — can be life-changing. 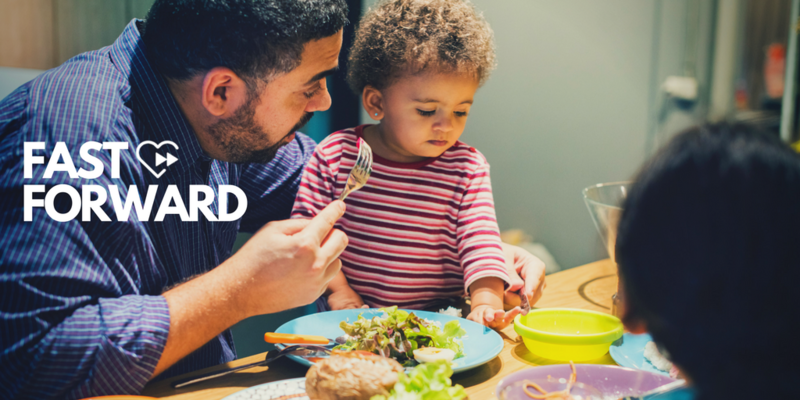 Good nutrition can improve growth and development in children, decrease healthcare costs, improve mental health and lead to fewer missed days at work for adults. We have a responsibility to not just fill our clients’ bellies, but to help them reach their full potential and foster vibrant, healthy communities. This includes educating individuals and families on how to make healthy, budget-friendly meals at home with the foods they receive at the pantry. Many of our clients have limited cooking experience and equipment. Or they may simply have never tried an eggplant or turnip before! Education and access are the bridges that connect health and hunger. — Sarah Huber. LifeOmic: What foods are high in energy content while also being healthy and nutritious? Sarah: Foods like avocados, nuts and seeds are high in energy content, but they are also very nutrient-dense. 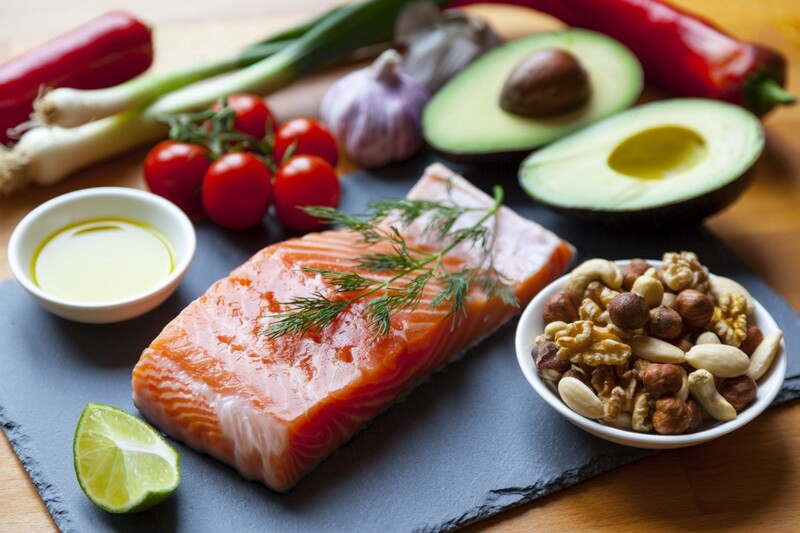 Their high unsaturated fat content does contribute calories, but this type of fat is beneficial for heart and brain health in controlled portions. These foods are also rich in fiber, protein, vitamin E and other micronutrients, so they can be nutritious parts of a balanced diet. LifeOmic: Can you tell us more about Produce Hope and Gleaners’ nutrition education programs? Sarah: Last May, Gleaners initiated a regional produce processing center through which we receive fresh produce directly from growers, pack it in mixed quantities of a variety of fruits and vegetables, and share it with food banks throughout seven Midwest states. This cooperative-style system keeps costs low and food quality high, and it has given Gleaners the opportunity to quadruple the amount of produce we distribute to our agencies and programs. The Produce Hope initiative has been the driving force behind an increased focus on nutrition and health for our organization. We provide simple recipes and tasting opportunities in the pantry to help our clients use foods that may be unfamiliar to them or prepare familiar foods in healthier ways. We also have nutrition education handouts to increase our clients’ nutritional knowledge and help them make healthy choices. We also host Cooking Matters at our on-site Cynthia H. Hubert Community Cupboard food pantry through a partnership with Indy Hunger Network. This free, 6-week class provides hands-on learning in culinary skills, nutrition education and shopping on a budget. Participants grow in community with one another and are able to take home groceries each week so they can apply what they’ve learned in class. 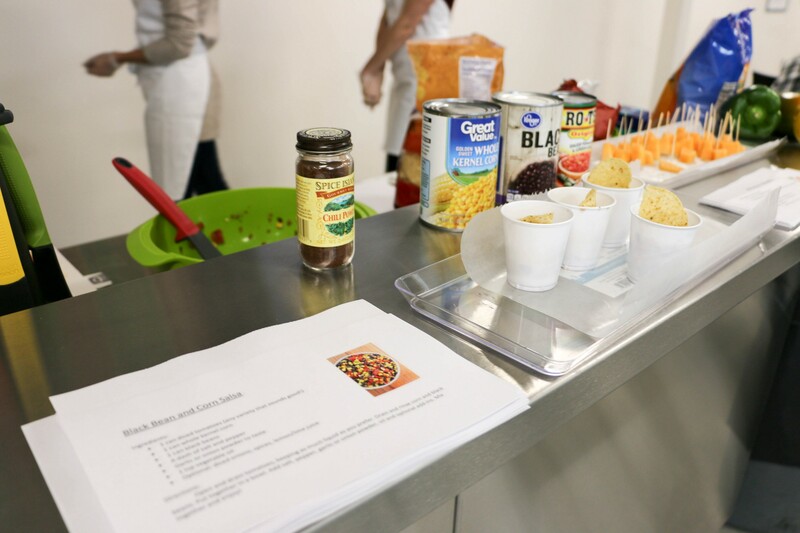 A recipe demo prepared by IUPUI dietetic interns for corn and black bean salsa in Gleaners’ Cynthia H. Hubert Community Cupboard food pantry. Photo credit: Alex Holland, Gleaners. LifeOmic: What steps can people take to eat healthier even if they can’t afford to pay more for food? Shop for deals at the grocery store. Check for sales and coupons before going shopping, and be on the lookout for specials at the store. Use the unit price listed on the shelf tag to compare the true cost of different products. Cheaper options usually include generic brands, bulk foods and whole produce. Fresh fruits and vegetables have lower prices and better quality when they are in season. You can find these foods at farmers’ markets or on display or on sale towards the front of the produce section. Many farmers’ markets offer SNAP match programs to double your SNAP dollars for fresh produce. Frozen or canned fruits and vegetables are nutritious and affordable options with a much longer shelf life. Choose canned fruit in 100% juice or water rather than in syrup to reduce added sugar. Look for no-salt-added or low-sodium canned vegetables and beans to limit extra sodium. Read the Nutrition Facts label on products and pick foods that are lower in sodium, added sugar and saturated fat. Choose breads, cereals, and pastas with “whole grain” or “whole wheat” listed as the first ingredient. Dried beans, eggs, peanut butter, and canned tuna or chicken are very inexpensive sources of protein. Buy larger cuts of lean meat and fish when they are on sale and freeze the extras for later use. Grow your own food! Did you know that SNAP benefits can be used to purchase seeds and plants for gardening? Try starting small with just a few plants and expand your garden as you gain more practice. Setting up groceries for Cooking Matters participants to take home and make a veggie quesadilla recipe. Photo credit: Alex Holland, Gleaners. LifeOmic: What should people who want to donate meals or food items to food banks know about the more nutritious items to donate? 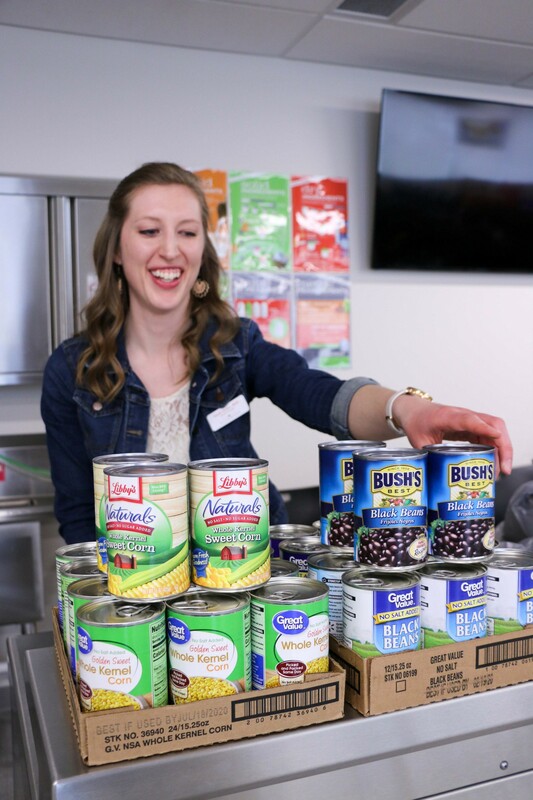 Sarah: We love when people feel moved to help us in our mission to feed hungry Hoosiers! What many people don’t realize, however, is that food banks like Gleaners actually purchase quite a bit of food to meet the needs of our 21-county service area. Because we are such a large organization, we can buy foods at bulk prices and get much more nutritious food per dollar than an individual would be able to get at the grocery store. The best way to make a big impact is to donate money that the food bank can stretch and use to purchase larger quantities of healthy foods like fresh produce, low-sodium canned vegetables, whole grains and lean proteins. If you do want to donate physical food, think about what kind of options you would want to have available if you suddenly had to rely on a food pantry for your meals. If you host a food drive, check with the food bank first to see what they need and then ask people to donate one or two specific items (e.g. canned fruit in 100% juice, whole grain pasta, low-sodium soups, canned tuna or chicken, etc.). This is much easier for the food bank staff to process than a bin of many different kinds of food that must be labeled and sorted before going out to clients in need. Moving a pallet of carrots at Gleaners’ CARE summer mobile pantry kickoff. Photo credit: Alex Holland, Gleaners. LifeOmic: What are your most pressing objectives in terms of improving health for Americans who are hungry? Sarah: My most pressing goal is for Gleaners to continue sourcing more foods that will not only help individuals manage chronic diseases like diabetes and heart disease, but also prevent these conditions and promote overall health in our communities. This will require our staff members, agencies, donors and the general public to work together to bring in foods that are nourishing, appealing and well-accepted by our clients. We serve a very diverse population, so it is crucial that we also consider the different dietary needs and preferences of our clients. We can’t improve nutrition if people don’t eat the food we provide! I also hope to continue expanding our nutrition education outreach through programs, recipes, classes and handouts that will help clients make good nutrition a practical and integral part of their daily lives. LifeOmic: Anything else you want to talk about, in regards to nutrition advice, optimal meal timing, etc.? Sarah: My nutrition philosophy is pretty simple: 1) take a little time to enjoy what you’re eating and listen to your body and 2) eat a colorful variety of whole foods as much as possible. MyPlate is an excellent visual tool that reminds us to eat from all 5 food groups — especially to fill half your plate with fruits and veggies!